OK, long weekend, lots of news. Let's get to it. So, Jerry Manuel, manager of the Mets is thinking of moving SS/ray of light, Jose Reyes, to third in the batting order behind Carlos Beltran. What? Why would you move a guy like that, who's a threat to bunt, steal, menace the pitcher, to an RBI type-role. And batting ahead of Delgado, so you remove a big portion of his threat to steal. Makes no sense to me. So underrated RB, Fred Taylor has been cut by Jacksonville. Couldn't you see him in an Eagle uniform—on a short-term contract—helping Westbrook and McNabb try to finally get that ring? 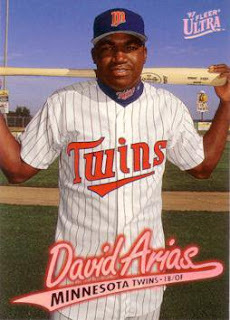 How come nobody every questions whether Big Papi took steroids? He's got all the signs. A body that went from normal to Michelin Man, a huge jump in hitting production, lots of nagging injuries that break down his body. Just wondering. Regarding this A-Rod mess. I'm disappointed; he'll never be the guy who cleans up baseball's records. And yes, he has real jerk tendencies, real prima donna crap. But did we really need the president of the United States to verbally slap him as well? Hasn't Barack got more pressing matters than slapping freakin' Alex "I was stupid." Rodriguez upside the head? Don't worry, Duke, about losing 4 out of your last 6. You play St. John's this week. If the rumors are right, and Ken Griffey signed with the Braves, than it looks like the Yankees might be keeping Nady and Swisher. At least for the foreseeable future. If Haynesworth goes to the Dolphins and takes all that cash Miami has to spend, how long do you think it takes till he complains about being in a 3-4 defense? How is Jeff Francoeur eligible for arbitration after last year? .239 BA, 11 HRs and he wants 1 million more than the generous (in my opinion) Brave offer. Are you kidding me? So Denver cut Dewayne Robertson yesterday 1 year after trading for him, then signing him to a five-year contract believed to be worth about $24 million. Now we know why they fired Mike Shanahan. Deals like this. 1 year, 1 1/2 sacks, all that money. I've written about this before, but really. Why is baseball getting eviscerated about steroids when it is obviously rampant in football and no one cares? The list is huge in baseball and well known, yet in football, Shawn Merriman gets busted, or Larry Izzo and a few others, and the world shrugs. It's barely even reported. Why is that? In fact, the Patriots "have appeared open to him returning for his ninth season with the team." I know football is more violent, more expected have bigger guys, colliding with each other. But that doesn't absolve the double standard. Cheating is cheating. And I don't know why baseball gets raked over the hot coals while football gets a free pass. It makes no sense to me. And finally, Dennis "Oil Can" Boyd wants to play ball again. You read that right. The man who last pitched in the MLB when the 1st George Bush was president, wants to pitch again. "After surgery in '87, it took me 10 years to feel good," he told the Globe. I wasn't on the field, started gaining weight. All of a sudden, my arm has healed. The arm strength is there and it's there consistently. The more I throw, the better it feels." Best of luck to him. And for pity's sake, I'll refrain from any "Rusty Oil Can" jokes. At least for now. Why not just move Reyes to clean up. It's the only role he is less suited for than 3rd. Watch...if they put him third and Delgado goes into a slump, Reyes will cry about not seeing enough fastballs. Taylor on the Eagles is a good fit. I'm thinking the Texans don't want to burn out Slaton, so maybe they'll try to bring in Taylor as well. With so many teams splitting carries between backs, maybe Fred can be a difference maker somewhere. You bring up a good point, P-Cat. It appears that the media is afraid to raise the obvious issue of steroids in the NFL. It's at least as obvious that NFL players are juicing as it was a few years ago in MLB. Football is so popular that maybe they are afraid of ruining a good thing. That's not an excuse, merely a possible explanation. True about Reyes. The move just seems odd to me. And true too about the Texans. 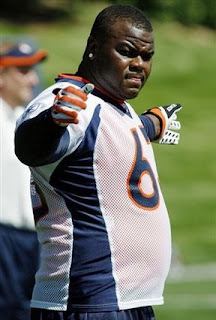 Slaton was a nice pick up, but they could use another guy to take some of the pounding off him. Funny, I head Mike & Mike mention the football thing about a minute after I wrote about it. Glad to see mainstream media picking up the fact that football is getting a free pass. Not only was not much done to Merriman. He went to the Pro Bowl that year and finished 3rd in defensive player of the year voting. That doesn't send a very strong message. At least they later put in a rule to disallow those kind of awards for someone who does test positive. Fred Taylor, I dunno I would give him an invite to training camp and see what he has, but he is definitely on the wrong side of 30 for a RB who has taken a lot of punishment already, and suffered a to of injuries earlier in his careeer.